Labor Day 2011 Job Fair, WHERE? I'm sorry that I am a little bit annoyed. 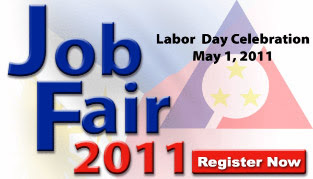 I'd really like to help the Department of Labor and Employment (DOLE) get the word out about the Job and Livelihood Fair which is going to be the centerpiece event of the Labor Day 2011 celebrations this coming May 1, 2011. But I find the information dissemination about it wanting. DOLE, in a press release, is encouraging job seekers to pre-register online for the nationwide job fair. So, it will be nationwide. But where? Is it so hard to put the specific venues where these job seekers would go to on the day of the job fair? Or are the venues still to be determined? In another press release, DOLE says that Labor Day 2011 is now on Facebook & Twitter but did not provide live links that will lead to those respective webpages. I feel that job seekers who use the internet looking for job opportunites and job fairs can get served better if they can get the specific information in a few clicks of the mouse. Is it just me, asking too much? Or the DOLE really needs to improve their press releases and ensure that they provide specific information faster for job seekers? Interested Filipino job seekers are encouraged to pre-register here. And hopefully, they will be informed where to go to for the job fair very soon.